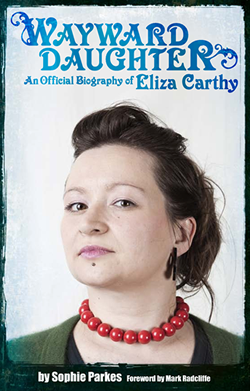 Wayward Daughter: An official biography of Eliza Carthy: The launch of Wayward Daughter - and you're invited! The launch of Wayward Daughter - and you're invited! We are delighted to announce that Wayward Daughter: The official biography of Eliza Carthy will be launched at The Greystones pub in Sheffield on Tuesday May 22nd, courtesy of the wonderful Bright Phoebus folk club. Eliza will be signing copies of the book and answering fans’ questions, as well as singing and playing with some very special guests, including Bellowhead frontman, Jon Boden, long-term collaborator, Saul Rose, and the Bar Steward Sons Of Val Doonican (plus a few surprise appearances). It’s the kind of night where anything could - and probably will - happen. You can buy your tickets here - but be quick, we know this is going to sell out rather quickly! We looking forward to seeing you, so tell us you're coming here.